Driftwood’s approach is founded on an attachment-based, sanctuary-informed model. This means that an individual’s healing begins when they can address the traumatic experience of addiction, mental illness, or chronic pain and rebuild a connection to self and others. The Driftwood experience involves top-notch clinical care from a team of therapists and medical professionals with decades of experience in the field of mental health, substance abuse, and chronic pain. 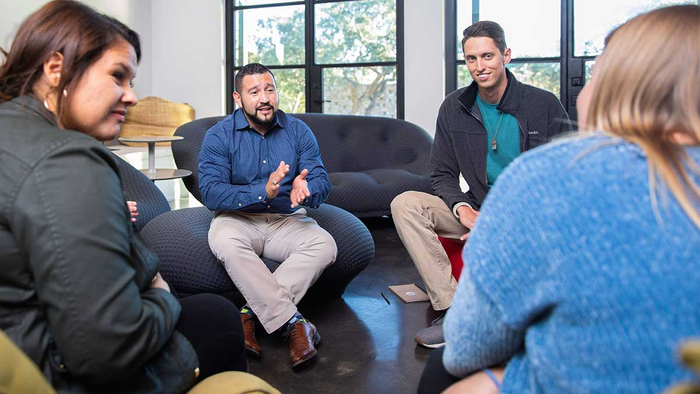 Individual and group therapies, experiential therapy, milieu therapy, and connection to a community of peers in recovery builds a strong foundation to sustain a life free of addictive substances. The healthy attachment that an individual can foster to self and others through the treatment process helps them turn clinical insight into action. Dialectical Behavioral Therapy, Acceptance and Commitment Therapy, and Mentalization-based Therapy offer tools to help individuals take a nonjudgmental stance toward themselves and others, manage difficult emotions, increase positive emotions, take committed action toward values, and communicate effectively and empathically in relationships. Individual therapy, group therapy, and family therapy help individuals develop insight into their world view, relationship patterns, personality style, and strengths. Insight gained from these therapies is used to inform new skills to practice in relationships. Group activities in nature and real-world settings present bountiful opportunities to practice new skills and have fun in recovery. Learning about the principles behind the 12 steps, developing one’s own personal definition of spirituality, and engaging with a sponsor and recovery community daily begins the practice of working through resentments and recognizing that one has support in this journey. Break the cycle of suffering through surrender. Contact Driftwood Recovery today to get more information or schedule a tour.